For the past 3 years, ALP Cycles Racing has had Spring training camp in Grand Junction, Colorado. Each year, the riders and our ALP coaches look forward to logging long miles with teammates in the sunshine. Each year, it has proven to be so much more than a training camp. This year, was no different with a daily exercise of flexibility. Somewhere in there are 5 bikes, 3 coaches, and 2 riders. This past weekend was year 3 of our Spring Training Camp. Split between 2 houses, we had 18 riders and 3 coaches. Routes, complete with daily skills and drills, were planned. Road bike, mountain bike, team work, Bobo bars, NBS Hydration, and food. We were ready! Day 1’s plan was to arrive mid day, quickly kit up, and do a lap of the Colorado Monument. 10min into our ride, the skies opened up, and temperature dropped. We changed the route, practiced double pacelines in the rain, and arrived back home 90min later half frozen. It was a good learning lesson in how to deal with the cold rain (vaseline, embro, clothing, fenders), and how to ride as a team in the rain. Not one person complained. It was a day of HTFU’ing as a team. Each night, we ate dinner as a team. Everyone would go to one of the houses and share cooking and dish duty. We ate appetizers/dinner/dessert, talked bike racing, learned about each teammate, and really bonded as a team. 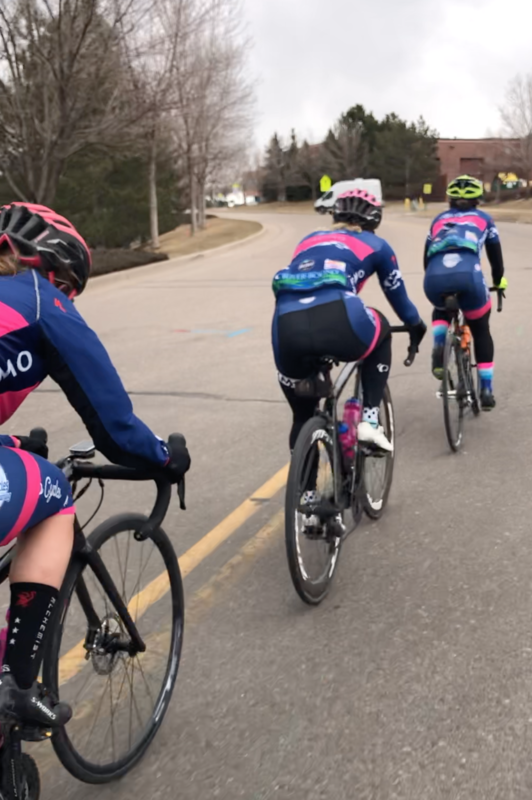 Our coach lead topics included, the 7 Guiding Principles of bike racing and how to apply them in races, cornering and line selection, and climbing how-to. We woke up to 35 degrees and rain on Day 2. Not ones to sit around and do nothing, each house did a core workout, talked about power meters and head units (Garmin, Wahoo, etc), and patiently (sort of) waited for the rain to clear. When it did, we had a great ride working on rotating pacelines, attacking with a teammate, chasing as a team, and getting more 3 hours in our legs. Day 3 would be our only sunshine day and we were ready to make the most of it. We finally were able to ride the Monument. While doing so, everyone worked on climbing while in and out of the saddle, and on the back side, descending and cornering. Back at home base, we split into 2 groups. 1- more roadie ride time, and 2- mountain bike ride. This is our first year having an official mountain bike team so this was a big deal. Our first mountain bike ride as a team. Day 4, Sunday, brought more rain and cold. We made the decision to pack up and head back to the Front Range for our final day of riding; race simulation practice. Breaking into small teams, we did team pursuit style racing. We then did 2 4-lap mock crit races. With 3 coaches everyone got great feedback and learning (and tired legs). 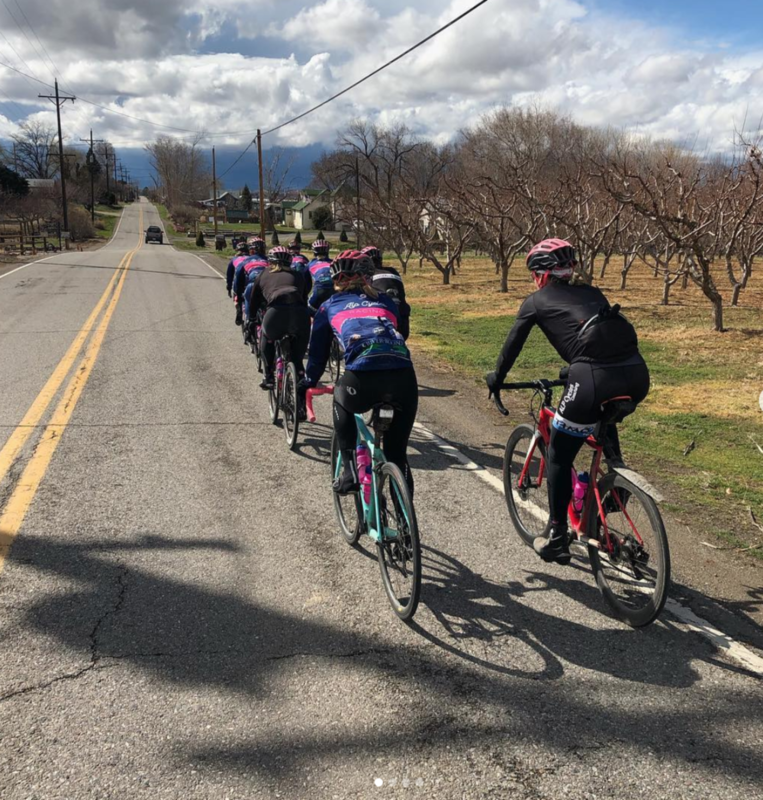 While we did not log long miles with teammates in the sunshine, we did log long miles with teammates in variable conditions and at varying times of the day. This lesson and training in being able to be flexible and roll with the punches is very important in bike racing. There are many things you can not control in bike racing but having the ability to stay positive, be prepared, and get the most out of each day is how champions are made. Here’s to a great 2019 race season!